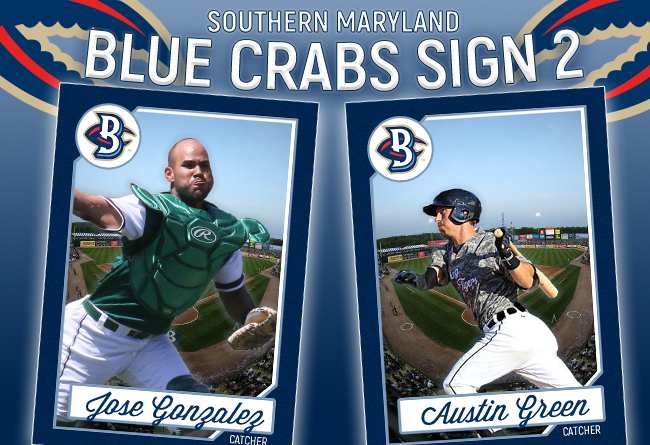 (Waldorf, Md., March 14, 2018) - The Southern Maryland Blue Crabs have announced the signings of two catchers for the 2018 season, Austin Green and Jose Gonzalez. The 28-year-old Green will join the Blue Crabs for his first season in the Atlantic League. The former Detroit Tigers farmhand spent five seasons in the minor leagues, reaching as high as AA. Green was a 13th round draft pick by the Tigers in 2013, after making back-to-back NCAA Tournament appearances with the University of San Diego. The California native had a breakout year in his first full season with the organization, hitting .263 with 15 homeruns and 53 RBI’s as a member of the Lakeland Flying Tigers. Green was named Florida State League player of the week in August of that season, as well as being voted a Mid-Season All-Star. He then spent the next two seasons playing at the AA level, hitting .248 in 139 games for the Erie Seawolves. The veteran Gonzalez heads to Southern Maryland with 12 years of professional experience. The Venezuelan was a free agent signing of the Colorado Rockies in 2006, at just 19-years-old. He spent the next nine seasons climbing the ranks of the Rockies organization, reaching as high as the AAA level. After a quick 14 game stint with the Southern Illinois Miners, Gonzalez joined the St. Louis Cardinals organization for the 2015 season. Gonzalez headed to the American Association in 2016, posting an All-Star campaign with the Gary SouthShore Railcats. The defensive-minded catcher has put up strong numbers behind the plate, throwing out 41% of baserunners throughout his career.